Marche Provencal is the marketplace in Antibes crammed with a number of stall holders selling fresh fruits and vegetables. Gorgeous juicy red tomatoes are the highlight of the market. 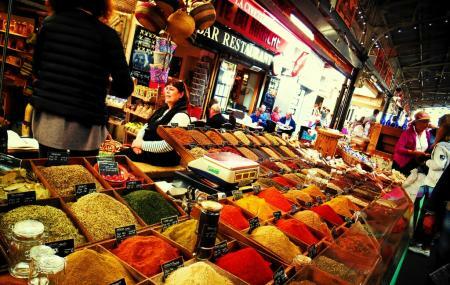 The market also sells a variety of other good and the most unusually flavored jams, chutneys, spices, colorful fruits, flowers, art work, products that are made of lavender and a lot more. Quite a few restaurants surround the flea market as well. The place is so strategically located that even rain would not be able to ruin your visit here. The market timings are estimated and are subject to change. Timings of different shops in the market may have different timings. How popular is Marche Provencal? People normally club together Musee De La Castre and Parfumerie Molinard while planning their visit to Marche Provencal. Historical marche' lots of great vendors. Meats, veggies, spices, art works. Well worth a visit or two! Great covered market. Lots of fruit and vegetables vendors but only one butcher. All surrounding shops and cafes we're also open on Sunday. Delightful. Fresh local meat and veg. Good quality but pricey. We love this place. A must see. All kind of flavors and smells to discover. If u r in the Antibes area and want provoncial food, spices, wine, chees, fruites or veggis this is the place to go. Come in the morning though.